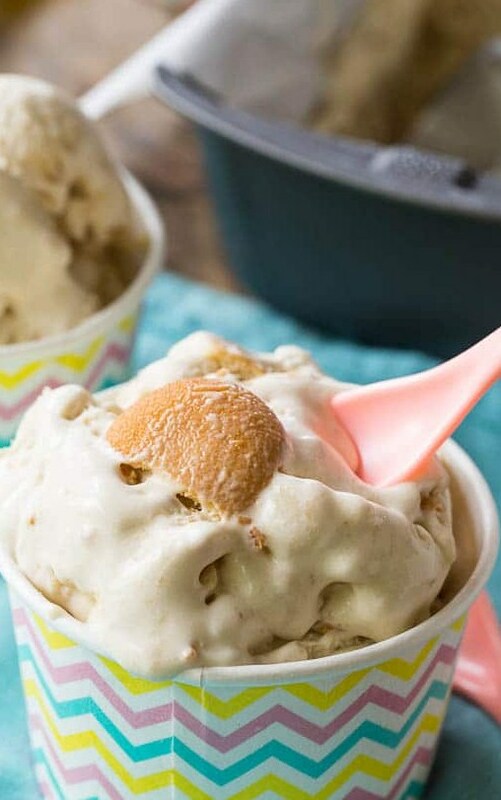 A creamy and rich banana pudding ice cream with real banana flavor and wonderful pieces of Nilla wafers mixed in. In a saucepan over medium-low heat, combine the half and half, brown sugar, white sugar, and salt. Stir until sugar dissolves, about 5 minutes. Take saucepan off heat. Place eggs in a medium bowl. While whisking, gradually (to not curdle the eggs) add about half the sugar mixture to the eggs. Pour egg mixture into saucepan with the half and half that remained in the saucepan. Cook over medium heat, stirring frequently, until mixture thickens and coats the back of a spoon. About 5 to 10 minutes. Take saucepan off heat and stir in vanilla extract. Pour mixture through a fine-meshed sieve into a bowl and let cool to room temperature. Once cooled, stir in mashed banana and pour into an ice cream maker. Use manufacturer's directions to freeze. Add Nilla wafers about 5 minutes before end of freezing time. If ice cream is too soft for your liking at this point, place in freezer for about 1 hour.